DVC87 is part of the 2017 Super Treasure Hunt set and 5/10 in the HW Speed Graphics series. It is Spectraflame aqua blue with a lined transition into black. “Falken Tires” and the Hot Wheels logo appear on the hood and sides; “873” is on the roof and sides; and “TH” with a variety of logos decorate the sides. The truck has a gray interior, Real Rider Deep Dish wheels, and a black plastic Malaysia base. 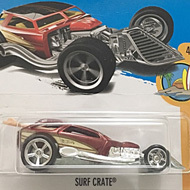 This vehicle can be found in mix “D” of 2017 Hot Wheels mainline cases. The Toyota Off-Road Truck made its debut in the Xtreme Trucks 2-pack in 2000. The modified racing truck is also known as the Toyota Baja Truck and was previously a Super T-Hunt in 2015.